Want something more than 135 full frame? Wanna upgrade your old camera and obtain a charming Leaf Credo medium format digital camera back with a good price? All are here in 9days! 9days is holding a special trade-in and upgrading promotion campaign of Leaf Credo 40/60/80 + Mamiya 645DF + 80/2.8 LS set. If you buy a brand new set of Leaf Credo digital camera back, you can use one digital camera of your own to trade-in. There is no limit on the brand of digital camera. The trade-in value of any digital camera is at least HK$10,000. It is even able to be higher according to the model and condition of your digital camera. The new campaign not only allows you to upgrade your old camera, but also allows you to use a cheaper price to obtain a new set of Leaf Credo medium format digital camera back. It has no reason to wait but immediately bring with your old camera to 9days! Mamiya Leaf, the king of medium format digital camera, launched Leaf Credo series medium format digital camera backs, Credo 40, Credo 60 and Credo 80 in 2012. They possess 40 Megapixels, 60 Megapixels and 80 Megapixels medium format CCD senor respectively. Leaf Credo consists of a 3.2” 1.15MP high resolution touch LCD screen and a viewing angle of 170°, which displays detailed images under any light condition. The Live View function perfectly assists precise focusing. The image captured by Leaf Credo is extremely clear and detail. ISO has a minimum value of 35 which greatly lowers the noise. Moreover, Leaf Credo provides rich colour saturation and layer, allowing result images to be almost real. It not only perfectly matches with Mamiya Leaf DF + Auto-focusing cameras, but also compatible with many other digital camera brands such as ALPA, Contax, Hasselblad, PhaseOne, Rollei, etc. Click here for more information of Leaf Credo and Mamiya Leaf. * The above prices are only for trade-in a brand new set of Leaf Credo. 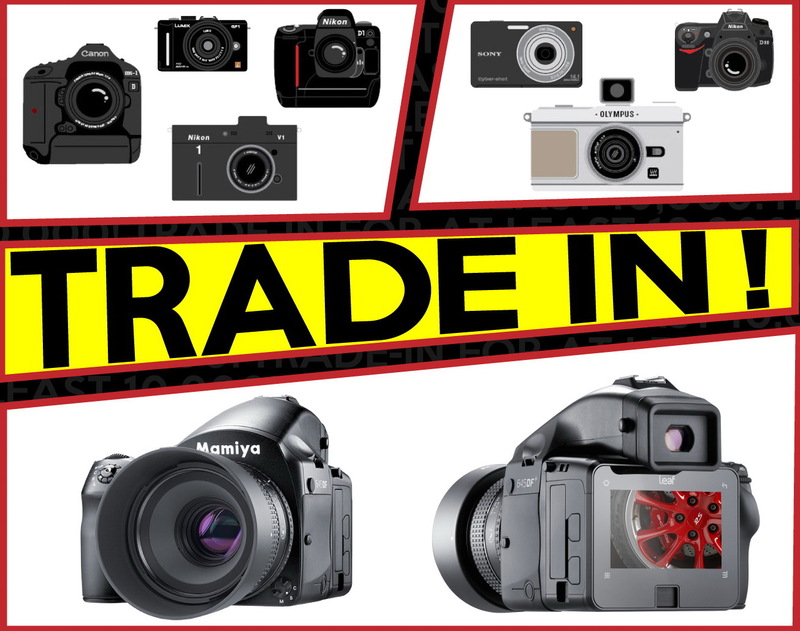 * Other digital cameras trade-in are accepted. Welcome to contact us for the trade-in price.